Jimmy's restaurant was pretty important in that it offered very good, very cheap food. I think it was Paul the American DJ who first took me there early on - 1965 perhaps. And I lost it. I thought it was on the south side of Old Compton St but in fact it was on the north side and next to Bar Italia! I actually re-discovered it on my last trip to London, one week after it had closed for good! This incredible time warp of a restaurant has now been going for well over fifty years, in a small basement on Frith Street, Soho, and I cannot do better than give you the short write-up of John Whiting, a famous food writer, initially of American origin, but now domiciled here. 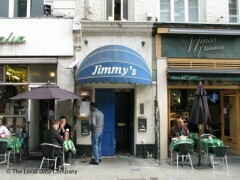 And there, off to one side on Frith Street, was Jimmy's. The last time I was in Jimmy's was in 1955. I was in the US Army stationed near Rushden - the end of the Birch Bus line - and my weekends were regularly spent in London, attempting to stretch my army pittance to infinity. Jimmy's was about the cheapest place to eat (a rough equivalent to Galotte's in Paris, so vividly recalled by Waverley Root in The Paris Edition). When I was down to my last couple of shillings I could always go there and fill up on something substantial. I stopped to look at the menu. Half a century ago Jimmy's was across the street, but it's still down an unprepossessing flight of basement stairs. Back in those days the few Greek dishes were scattered through a list of the standard English fare demanded by labourers and cabbies, but that portion of their clientele has long departed, so Greek Cypriot now reigns supreme. Would it be edible? What the hell, today's Nostalgia Day - go for it! Downstairs was a much more respectable establishment than the one I used to frequent. Not only were there white tablecloths; they are clean. But the décor must date from closer to its origins than to the present day - rough white plaster, a primitive painted mural, ancient furniture and a wall space in a corner covered with cards (already showing three years' yellowing) to congratulate them on their fiftieth birthday. At two-thirty in the afternoon there were fewer than a dozen people in the restaurant, most of them as superannuated as your reporter, and all of them speaking Greek. A couple of diners got up from a table and went behind the bar, where they resumed their real identities. A waiter came over with a menu. When I told him it was my first visit in almost half a century he smiled, but showed no particular surprise. Later he appeared to be telling two women behind the bar; amidst the flow of Greek I heard the words "forty-five years" and the women smiled in my direction. No big deal. I might well have been the second geriatric to show up that very day. A generous dish of black olives and little green peppers appeared. From the well-worn menu (unchanged since the 60s, said a tattered newspaper clipping on the wall) I selected a starter of little Greek Cypriot meatballs and a main course of stifado - meltingly delicious when it's properly prepared, coarse and stringy when it's not. The meatballs were crisp on the outside, with moist and herby interiors. The stifado, an enormous pile, I could easily have cut with a spoon - moist, springy, redolent of long marinating and slow cooking in strong red wine. It was accompanied by dark brown crisply fried potatoes, roughly cut in irregular chunks and loaded with deliciously wicked calories. There was barely room on the plate for the small green salad, undressed but with oil and vinegar separately on the table. An attractive young woman swept through the door and across the room to an old man who'd apparently been waiting for her. "I'm so sorry I'm late," she apologised effusively. It was the first English I'd heard. His granddaughter, probably. This is the sort of place where, if you see a pretty girl with a man old enough to be her father - he is. A wedge of baklava for dessert (about twice the usual size), with good crisp pastry, lots of nuts and not too much honey. Then a large cup of strong Greek coffee, minus sugar as per my request. I could see the old man with a walrus moustache behind the bar taking the pot off the fire twice, in accordance with the proper ritual. It was a comfortable place to sit and read, the Greek music at a low level a welcome respite from the aggressive din of central London. The bill for my immoderate lunch, including a generous glass of Greek red wine, came to a moderate fifteen pounds. If this had been some village in the south of France, and Jimmy's a local auberge still offering the same local specialities they had served for a couple of generations, I'd be writing a glowing encomium to French culinary integrity. But an ordinary Greek Cypriot taverna in the middle of Soho, which will only serve a mixed meze to a party of four or more? Where's the story in that? Forget it - it's not even listed in Time Out any more. Hilary James Jimmy's was renowned in my alma mater (St Martins school of Art) in the 60s as a place where even we could afford a good square meal. I usually had the beef stew, which came complemented perfectly by some chopped raw white cabbage, plenty of French bread and a little dish of proper butter. All delicious, and served promptly enough to fit into our lunch hour. (Our tutors' favourite haunt, by contrast, was Patisserie Valerie, where they could be sure of getting a rest from the students).